I am reading the new release of the book Priest Block 25487 which was published in English in 2007. The book was written by Jean Bernard, a Catholic priest, immediately after his release from Dachau in August 1942 and first published serially in 1945 in the weekly supplements of a Catholic newspaper, the Luxemburger Wort. I first heard about this book from someone who visited my web site scrapbookpages.com and e-mailed me that my original section about the treatment of the priests at Dachau was all wrong. I updated and revised that section of my web site, which I had written before I was told about Father Bernard’s book. After reading the book, I am very dubious about some of the incidents which Father Bernard described. I got most of my information about the treatment of the priests at Dachau from the book entitled What was it like in the Concentration Camp at Dachau? by Dr. Johannes Neuhäusler. Curiously Dr. Neuhäusler didn’t mention any mistreatment of the priests at Dachau. In the new version of Jean Bernard’s book, I learned that he arrived at Dachau on May 19, 1941 and he did not mention being put to work on his first day in the camp. Obviously, there was an error in either Dr. Neuhäusler’s book or in the memoir of Father Bernard when it was first published in 1945. My overall impression of Father Bernard’s book is that he dwells excessively on every tiny bit of his alleged mistreatment at Dachau so that he will be considered a martyr, and potentially be canonized as a saint. For example, the passage on pages 33 and 34 of the book in which Father Bernard writes about the priests being given a daily ration of wine which they were forced to drink. Not everyone is capable of drinking a quarter-liter of wine in one gulp. As soon as our cups are empty we have to hold them upside down above our heads. Note that he wrote “three men to a bottle” which would be a third of a liter of wine, but then he also wrote “a quarter-liter.” So which was it? A third of a liter of wine per day or a quarter liter of wine? Note that he writes that not everyone can drink a quarter-liter in one gulp, implying that they were not punished if they didn’t drink the wine in one gulp. One prisoner chokes out of nervousness and falls behind. In a flash the SS man is on him and slams his fist into the bottom of the cup so violently that the metal rim slices a semi-circle through his lips and cheeks, all the way down to the bone. I don’t believe this story. I think that this was Father Bernard’s way of turning a privilege, that was given only to the priests, into an act of torture. What was the name of this priest? How about including a photo of this man’s facial scar in the book? I’ve never seen a cup with a sharp metal rim. 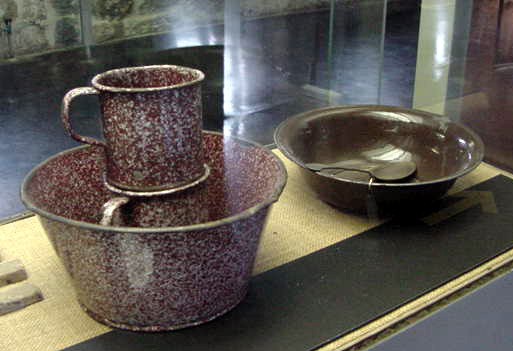 The prisoners at Dachau ate from enameled dishes and drank from enameled cups. 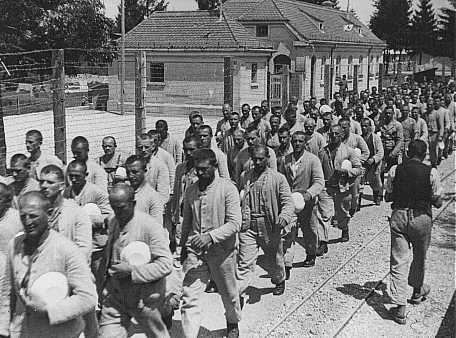 Look at the photo below, which shows Dachau prisoners carrying metal bowls coated with enamel. Look at the photo of a cup used at the Mauthausen concentration camp. Does it look like the cup has a sharp rim that could cut a man’s face to the bone? Father Bernard also wrote extensively about how the priests were forced to make up their beds. He mentioned that the bed covers were blue and white striped. Look at the photo below which clearly shows that the bed covers had checks, not stripes. Was Father Jean Bernard actually at Dachau? Many of the “tortures” that Jean Bernard describes in his book are still told to tourists at Dachau; for example, his story about an SS man who turns up the water in the shower room so hot that the prisoners think they are being “scalded alive, then suddenly makes it ice cold.” Is it possible that the SS man was only trying to get the temperature just right by first turning on the hot water and then the cold water? On the same page, he tells about being given a shirt, jacket, a pair of trousers and also socks. This is news to me. I didn’t know the prisoners were given socks. Maybe this was only for the priests. Then he writes about how the SS photographer has a “spring-mounted spike” on the seat of the chair where the prisoners had to sit for their photo when they were first brought to the camp. No one told SS judge Dr. Georg Konrad Morgen about this when he came to investigate the Dachau camp, and he gave the SS men and the Commandant at Dachau a good report. Father Bernard didn’t even know the name of the Commandant of Dachau; he mentioned that the Commandant’s name was Hoffman, but there was never a Commandant by that name at Dachau. An Introduction to the book is provided by Robert Royal who writes excessively about the truthfulness of the book, making me suspicious that he knows that the book is full of lies. For example, Royal writes “He takes great pains to be accurate…” and “His strict regard for truth…” Royal wrote that in 1932 there “were 21 thousand priests in Germany, but by the time Nazism was defeated a decade later, more than eight thousand of these men had either been threatened, beaten, imprisoned, or killed by the regime.” To me, this sounds like a gross exaggeration. Finally Robert Royal writes in the introduction that the priests were sent to Dachau “as a way of keeping them together and thereby preventing them from ‘infecting’ other prison populations with Christianity.” Does he not know that the German bishops and the Pope persuaded the Nazis to send all the priests to Dachau, the mildest camp of all, so that they could be given special privileges? Or is he just denying that the priests were treated better than the other prisoners? For example, Marcel Pasiecznik was a Polish priest who was first sent to the Flossenbürg concentration camp. According to Father Pasiecznik’s own account of his stay at Flossenbürg, the prisoners were not expected to live longer than three months; they were forced to work 12 hours a day at hard labor while receiving only 1,000 calories of food per day. In only two months, he lost 50 pounds. He did not hide the fact that he was a priest: he would hear the confessions of his fellow prisoners as they worked side-by-side. Eventually, he was transferred to Dachau which was the designated camp for Catholic priests. I should have died at Flossenbürg, but God had other plans. Once again, he intervened at the last moment, and I was transferred to the Dachau concentration camp. Strange as it may sound, Dachau saved my life. Priests were imprisoned under relatively less rigorous conditions at Dachau – this was one of the few concessions which the Holy See had been able to wrest from Nazi Germany. God’s merciful providence sent me on my way with a package from a local pastor, a German Catholic priest. It contained bread, apples and a Latin edition of The Imitation of Christ. After the war I was able to thank him personally, and that’s when I determined that he had arranged my life-saving transfer. 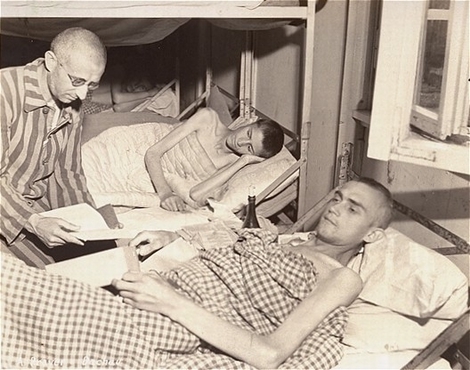 When I arrived in Dachau, my death was further forestalled thanks to the good graces of the other Polish priests there and the American Red Cross, which sent us care packages. I was made a tailor, which meant light work done indoors. There were 800 priests in one barrack, all Poles, and 400 priests from Germany and all over Europe, in the other. There were 28 barracks in Dachau in total. The authorities permitted the German priests to say Mass daily in the chapel in their barracks. They in turn smuggled bread and wine to the Polish priests for them to say Mass as well. I participated every morning in this secret Mass and received Holy Communion. And three times I celebrated Mass for my colleagues before our liberation. I even made visits to the Blessed Sacrament reserved in the German priests’ chapel, but you had to tell one of them the watchword. One time I remember it was “Lux de luce,” light from light. I received a care package from Poland, which contained bread, stockings, a cap and the “Novena to God’s Mercy,” revealed to Sister Maria Faustina Kowalska. This last was a miracle because the package must have passed through Nazi hands. Pope John Paul II has elevated Sister Faustina to “Blessed” in recent years. You can read Part II here and my impression of the book cover here.